The crinkle cut chip bursting with tomato flavour. 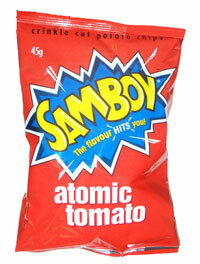 The Atomic Tomato flavour was discontinued in 2003, but they have been brought back by public demand. Potatoes, Palm Oil, Sugar, Salt, Food Acids (E262, E330), Spices, Whey Powder (Tomato, Onion, Garlic), Starch, Soybean Oil, Flavouring (Milk), Flavour Enhancers (E621, E631, E627), Colour (E160C).